Researchers in Italy have shown that medicinal gold compounds interact strongly with the proteins of the copper trafficking system, which could have implications for drug delivery. The copper trafficking system consists of proteins that help the uptake of copper into cells and then promote its transfer and delivery to copper-dependent cellular proteins. One of these ‘chaperones’ is known as Atox-1. Previous work has shown that platinum-based anticancer drugs strongly interact with copper trafficking system proteins and Messori and co-workers hypothesised that medicinal gold compounds might also do the same, especially in the +1 oxidation state; soft lewis acids, such as gold (I) ions react eagerly with Atox-1. The interactions of three gold (III) compounds with Atox-1 were analysed through ESI-MS and revealed the formation of metal-protein adducts. The same major adduct was invariantly formed, matching the protein binding of a single gold (I) ion. Formation of this adduct implied that the gold (III) complex had broken down, a loss of ligands and reduction to a gold (I) species. ESI-MS also displayed peaks that corresponded to protein binding with two gold (I) ions. A stability study showed that one of the three gold-protein adducts was stable over 72 hours. From their findings, the authors conclude that the cytotoxic gold compounds investigated form stable adducts with copper chaperone, Atox-1. These results have implications for medicinal drug design and our little friend, Atox-1 stays in a job. Published on behalf of Sarah Brown, Chemical Communications web science writer. Methods of allylic etherification are usually involved synthetic procedures, due to the need for activation of the starter aliphatic alcohol. By contrast, no such problems exist in analogous reactions to form allylic amines. Significant steps have been made in this synthetic area, but limitations remain. Iridium catalysis has been successfully employed for this reaction but usually requires the use of a glove box. Derivatisation of starting materials to incorporate suitable leaving groups has also been explored, as has the use of various bases to deprotonate the alcohol nucleophile. Tertiary butyl alcohol has been extensively investigated for its reactivity also, but it appears that the more conditions you put on this reaction the more limited its scope and applicability become. Add to this the effect of each modification on product regio- and stereoselectivity and you can appreciate the challenge. Each new ‘improvement’ can leave you, figuratively speaking, one step up, and two steps back. With this situation in mind, the Lee group from Heriot-Watt University report a considerable breakthrough in the catalysis of the allylic etherification of unactivated alcohols, using a gold(I) salt. Well chosen controls and an extensive optimisation of the reaction parameters has yielded a robust strategy, effective for a wide range of substrates and aliphatic alcohols, with very good to excellent regio- (SN2 vs SN2′) and stereoselectivity (cis/trans). An inert atmosphere is not even required. The use of Lewis acidic gold(I) for this reaction seems to provide a reliable activation of the olefin of the allyl group, to nucleophilic attack from the external alcohol nucleophile, all helped along by the possible involvement of a six-membered transition state. It would appear that it is this activation and plausibly reliable mechanism, that has allowed this usually difficult process to be controlled, both chemically and stereochemically. A large variety of alcohol nucleophiles, (including primary, secondary, tertiary, and functionalised examples) and allyl alcohol electrophiles have been screened. Overall trans- products with SN2′ regiochemistry are highly favoured. An interesting selection of control reactions were performed, including the use of a hindered proton sponge to prove absolutely the effect of the gold(I) catalyst as well as the sole use of the acidic bis-trifluoromethylsulfonimide (HNTf2) as catalyst, which resulted in a conversion of less than 5%. 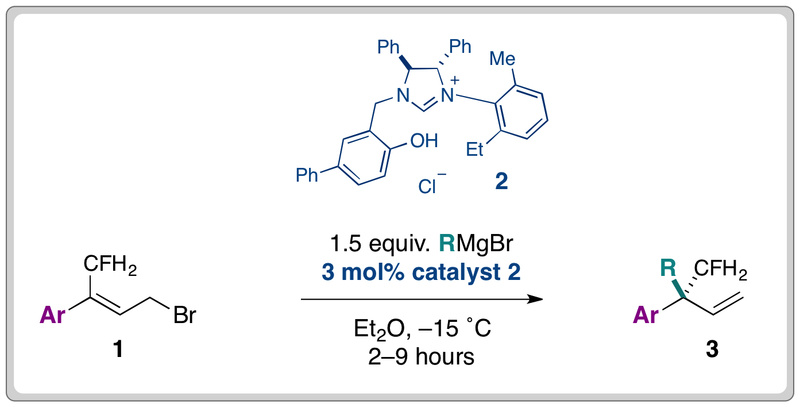 The authors report a breakthrough in the allylic etherification of aliphatic alcohols, the application of which should be substantial, as the team now turns its attention to possible applications in asymmetric synthesis. Published on behalf of Kevin Murnaghan, Chemical Communications web science writer. Aromatic compounds substituted with a C-S bond are of importance for pharmaceutical and medicinal chemistry, and materials science. A widely employed route to such compounds is a cross coupling reaction, between an aryl halide and a thiol, to yield a thioether. The reaction is usually mediated and catalysed by a metal centre such as palladium, indium or nickel, present as a salt or complex. In this communication, the authors report a high yielding, transition metal free route to aryl thioethers, using just a disulfide and a weak base, in a suitable solvent, under an inert gas. The authors proved early in their study that a metal salt was not required for reactivity, with better yields being recorded for such reactions, versus a metal salt containing control. A further control reaction was carried out, to disprove the presence or effect of any trace transition metal by using ultrapure caesium carbonate (99.994% purity) and freshly distilled solvent. The model reaction investigated and optimised was the thiolation of 2-phenyl-1,3,4-oxadiazole with di-p-tolyl disulfide. Reaction conditions which gave the best yields involved the use of 2 equivalents of base and 1,4-dioxane as solvent, under an argon atmosphere, for typically 18-24 h. 5 equivalents of disulfide were found to be the most effective. Using 7 equivalents gave no benefit to the final yield. Coincidently, the excess disulfide proved easily recoverable from the reaction mixture. Electronic effects proved to be important in the reactivity of the phenyl-oxadiazoles with electron donating groups present on the arene promoting the reaction and electron withdrawing groups having a negative effect. The reaction also shows a good degree of robustness in being effective in thiolating indole and 5-methyl-indole at the 3 positions in excellent yield, as well as other substrates such as caffeine and benzimidazole. This synthetic methodology represents an important simplification in the preparation of heteroaromatic thioethers, and should prove of interest to synthetic chemists, particularly in the areas of medicinal chemistry, materials science and total synthesis. Researchers at the University of Münster have developed an unusual variant of the Staudinger reaction which takes advantage of frustrated Lewis pair (FLP) frameworks to provide internal stabilisation. The Staudinger reaction represents an important tool for the generation of iminophosphoranes, which can be subsequently utilized in the synthesis of a wide range of functional motifs, including amines, imines, and amides. Additionally, with the variation of the phosphorus compound, the Staudinger reaction can be employed in bio-ligation processes under mild conditions. Traditionally, the iminophosphorane product (3) is generated from the reaction of an organic azide (1) with a trivalent phosphorus compound. This is thought to proceed via transition state 2, from which elimination of dinitrogen yields the iminophosphorane (3). In the variation developed by the Erker group, such elimination of dinitrogen is avoided, generating products such as 4. This unusual reactivity was cleverly obtained through the incorporation of the phosphorus moiety in an FLP; specifically, vicinal phosphane–borane FLPs (5). Upon reaction with mesityl azide, these FLPs led to the formation of 5-membered heterocycles (6). Following thermolysis or photolysis, phosphinimines (7) were obtained which benefit from internal stabilisation from borane. The by-product of this formation is indazole 8. While the mechanism of this unusual variation has yet to be confirmed, the authors propose a pathway proceeding via the ion pair 9. This work contributes to the broadening utility of the Staudinger reaction, and illustrates the potential of FLP chemistry in the development of new reactivity. Published on behalf of Ruth Gilligan, Chemical Communications web science writer. Researchers in China have been able to visualize the intracellular location of DNA origami with a label-free fluorescent probe. Direct visualisation of the distribution and stability of DNA origami in live, cellular systems has not been achieved. Fluorescent labels can be attached to DNA strands but these have their drawbacks, such as weak emission intensity, photobleaching and expensive. Ding and co-workers looked at alternatives to visualize DNA origami in live cells. The group were inspired by research on a series of carbazole-based cyanine fluorescence probes, which have a weak emission when they are monomolecularly dissolved but switch to a strong luminescent state upon binding to DNA or protein molecules. The significant enhancement is attributed to restricted intramolecular rotational (RIR) motions by anchoring the DNA molecules, which causes the large reduction in the non-radiative decay of fluorescence molecules. Ding and co-workers then took some tubular DNA origami, the cyanine fluorophore and found that the carbazole-based cyanine molecules could be used as a sensitive optical switch, turned on when DNA origami is detected and turned off when the nanostructure degrades. After incorporating the cyanine probe molecules, the DNA origami-probe complex was administered to live cells. Excitingly, the green-yellow frog… erm, I mean, fluorescence was visible inside the cells treated with the probe. The group went further to try and understand the internalization mechanism of the DNA origami and found the probe localized in lysosomes. Finally, degradation studies showed that most DNA origami were dissociated after 60 hours, also a bit like my origami frog. Unlike my attempts at origami, Ding and co-workers have demonstrated an exciting step in scaffolded DNA origami and its future applications in nanomedicine. Synthetic organic chemists have long regarded the Wittig reaction as one of the most significant methods for the creation of new C–C bonds. Now, researchers at Peking University have reported that this time-honoured reaction can be used for the modification of proteins in a bioorthogonal process. Bioorthogonal processes represent a growing area of interest, encompassing reactions which can take place under physiological conditions. That is, the reaction must proceed at neutral pH in an aqueous solvent at ambient temperature and low concentrations, with high selectivity. Given these challenging parameters, the range of bioorthogonal processes remains limited. The Ye group, based at the Key State Laboratory of Natural and Biomimetic Drugs, have contributed to the expansion of this fascinating area of chemistry by successfully applying the Wittig reaction to their one-pot site-selective protein modification. The first step involves the incorporation of an aldehyde at the N-terminus of a peptide chain (1). This could be achieved by the periodate oxidation of N-terminal serine or threonine residues, or by PLP (pyridoxal-5-phosphate) oxidation of N-terminal glycines. The resulting aldehyde (2), without the need for isolation or purification, could be reacted with an ylide (3) to form a wide variety of functionalised peptide products (4). Di-, penta- and hexa-peptide substrates could be functionalised in this manner, using water and t-butanol as co-solvents at room temperature. The strength of this site-selective reaction was further demonstrated by modifying myoglobin. Crucially, this was achieved with no damage to the protein’s secondary or tertiary structure and, furthermore, Prof. Ye’s group established that myoglobin’s oxygen storage and release function was unaffected. The functionality introduced offers the potential for further structural modification, or for use in medical imaging. With protein-based pharmaceuticals becoming widely used, greater insight into protein function and behaviour is of paramount importance. This methodology has the potential to be a valuable tool in that understanding. Luminescence from lanthanide-based compounds is currently exploited in electroluminescent devices ranging from glucose monitoring sensors to thin-film displays. Triarylboron groups are known to greatly enhance the fluorescence or phosphorescence of transition metal complexes, but such compounds are very sensitive to oxygen quenching and are unsuitable for use as sensors under ambient conditions. The combination of these groups with lanthanides may offer enhanced luminescence in more ambient-friendly lanthanide-based materials. The Wang group from Queen’s University, Canada have synthesised the first examples of triarylboron functionalized Tb(III) and Eu(III) compounds, and have shown that the BMes2 group is extremely effective at activating lanthanide emissions. The new compounds have been tested as sensors, showing that such triarylboron functionalized lanthanides may be promising new CN– and F– anion sensors. To find out more, download this HOT article now (free to access until the 5th of December 2012). Posted on behalf of Katie Renouf, Chemical Communications web science writer. The Cram Lehn Pedersen Prize, named in honour of the winners of the 1987 Nobel Prize in Chemistry, will recognise signicant original and independent work in supramolecular chemistry. Those who are within 10 years of receiving their PhD on 31st December 2012 are eligible for the 2013 award. The winner will receive a prize of £2000 and free registration for the ISMSC meeting in Crystal City, Virginia. In addition to giving a lecture at ISMSC, a short lecture tour will be organised after the meeting in consultation with the Editor of Chemical Communications, the sponsor of the award. Please send your CV, list of publications (divided into publications from your PhD and post-doc and those form your independent work), and if desired, letter of support, or these materials for someone you wish to nominate to Prof. Roger Harrison (ISMSC Secretary) at rgharris@chem.byu.ed by 31st January 2013. 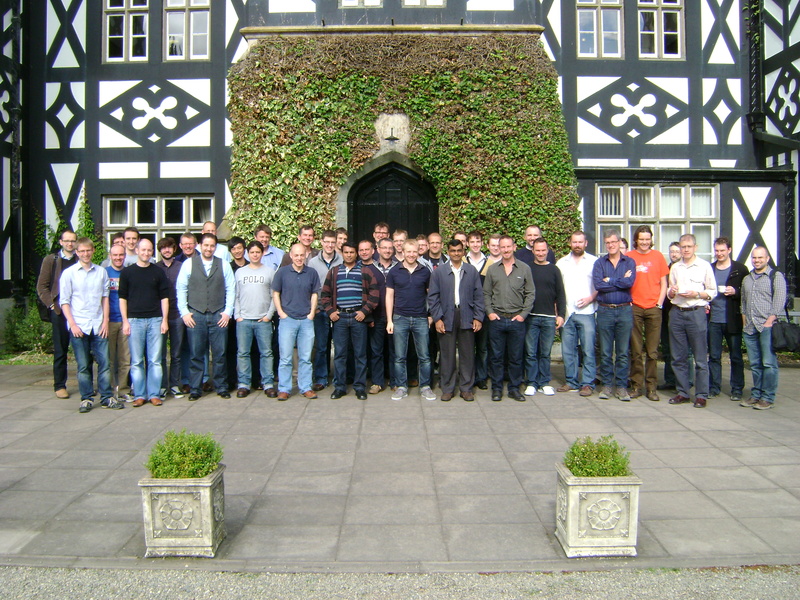 The annual Gregynog Synthesis Meeting was recently held at Gregynog Hall (Thursday 13th to Saturday 15th September), amidst the stunning beauty of mid-Wales and accompanied by fair weather. 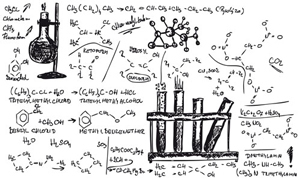 A group of 55 chemists came together to discuss recent progress in organic synthesis. As befits such a broad remit, the range of stakeholders present was pronounced with academic, industrial and scientific publishing attendees all present. As synthesis is an enabling and under-pinning scientific discipline, it was perhaps not surprising to see the range of contexts in which speakers discussed their synthesis. Catalysis, methodology and natural product chemistry were not-surprisingly representative; however, the audience was also treated to medicinal, process and supramolecular chemistries. The relaxed and residential character of this event helps to encourage a collegiate ethos, helping to welcome younger chemists into the wider synthesis community. Such an ethos facilitates the discussion of initial results on new and adventurous projects in a supportive environment. In this regard, the fresh-faced Dr David France (University of Glasgow) struck a chord with the audience through his imaginative Pd-catalysis work. The meeting is structured around the complementary formats of a number of short “chalk+talk” presentations (15 minutes with lively discussion and questions) supporting the two main keynote speakers in the evening, one of which has travelled beyond these shores. These keynote speakers have the opportunity to convey what exactly has made them the international names they are. What does the genesis of an idea require? How do the independent research strands in a research group interact with each other? And, importantly for the younger colleagues, how are difficult scientific challenges conquered? The Thursday evening saw Prof Jonathan Clayden (University of Manchester) present the Chemical Communications keynote talk and embraced the meeting’s ethos with a career spanning discussion of the intertwining chemistry problems his group have tackled. The Friday evening session had Prof Dirk Trauner (LMU, Münich) present the Nature keynote talk. Earlier in the meeting, a member of the organising committee had suggested that his talk would be all the better, fitting the meeting’s remit, if he presented lots of “failed reactions” as a vehicle to conveying how he tackled organic synthesis problems. 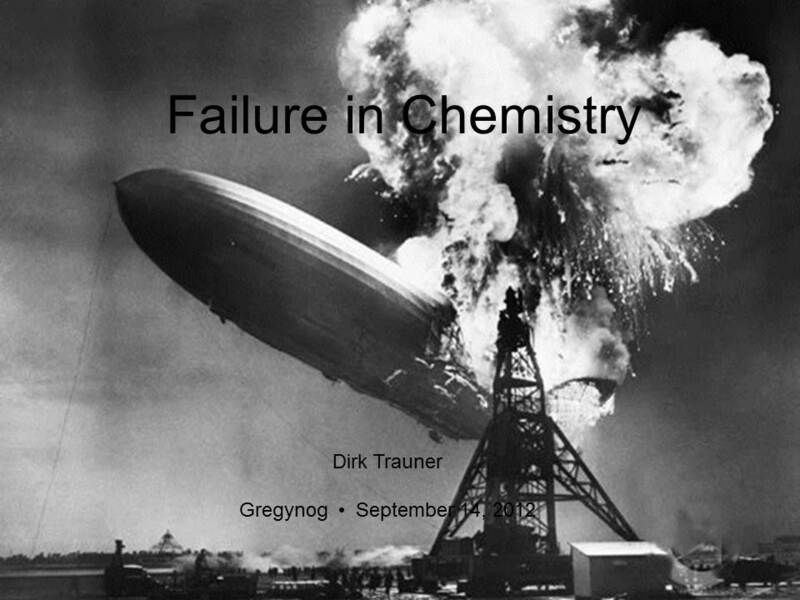 In this respect, it was a delight to later find, in my opinion, the most visually striking slide in a chemistry presentation I have yet seen. Prof Trauner went the extra mile in passing on his undoubted experience in synthesis problem-solving with some exquisite answers and suggestions. These keynote talks, as indeed were the short presentations, were interspersed with comments, suggestions and questions from the floor, indicative of the discerning yet approachable audience. Finally, the Dave Kelly cup is awarded annually to a chemist who has engaged the audience with difficult concepts in a concise manner, with clarity at the chalk board. This prize is awarded in memory of our colleague Dr Dave Kelly, who was, for many years, synonymous with this important pillar in the synthesis calendar. Without doubt, Dr Steve Goldup (QMUL) was the chemist who hit the spot in this regard. The cup is on the way to the East End as I type.